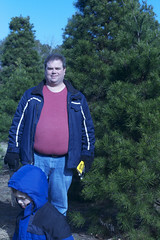 Last year, we decided to start a family tradition of going out and cutting down our Christmas tree. 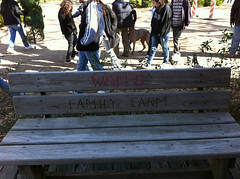 Our great friends Jerry and Kris Scott told us about this farm they went to called the Walls Family Farm. We decided to go and had a great time. 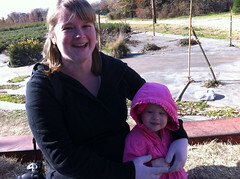 This year, we started down the path of cementing the tradition with another trip to the Walls Family Farm. 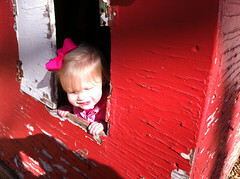 It was a lot better weather this year and Emily was able to participate much more being almost 2 years old. 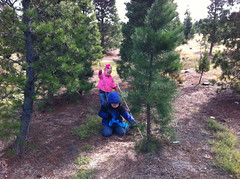 The kids loved the hayride to get out to the tree fields, but maybe not the wandering around looking for a tree. They enjoyed that part for a little bit, but tired of it quickly as Maggie and I debated tree after tree. 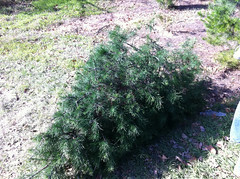 We finally found our tree and I cut it down. We hauled it back to the barn so we could get it wrapped up and strapped to the roof of our car. 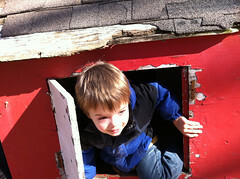 During this wait, the kids played in the nearby play set and they had a blast. Hey, you got some good pictures I hadn’t even seen yet! Way to go on blogging something other than link. Twice! ah man! 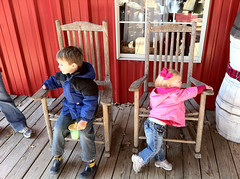 so nice to see the Walls Family Farm…even if from afar. All our best to ya’ll this season and New Year.